Not to be confused with Fan Boys. Info "Can you keep the paper butterfly in the air? It requires gentle motions of your wrist to keep it afloat." Fan Boy is a Microgame in WarioWare: Smooth Moves. It is found only in Mona's stage. The name is a pun on the word "fanboy". The player must blow the butterflies and keep them in the air for the remainder of the microgame. If the butterflies drop, the player loses. The fan may be red with a M on the side referencing Mario, or it may be green with a L on the side referencing Luigi. 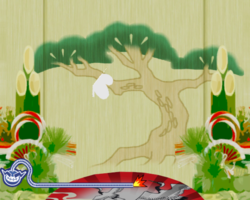 1st level difficulty: The player must keep a few butterflies in the air. 2nd level difficulty: The player must keep more butterflies in the air. 3rd level difficulty: The player must keep several butterflies in the air. This page was last edited on February 15, 2019, at 13:41.